My life changed for good in January when Sylvie was born. I became paralysed ten years ago and have never felt happier or more fulfilled than I do today As my belly swelled, I became increasingly excited and nervous about motherhood. 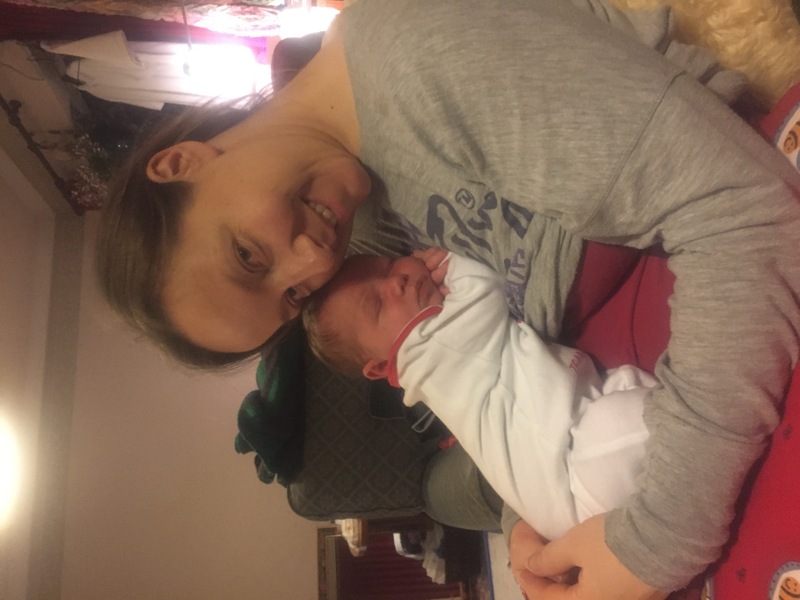 I’d always wanted to be a mum, but well aware that I don’t function well on limited sleep, I wondered how I’d cope waking every couple of hours to feed a newborn. I know hard work. As a Paralympic athlete I pushed myself to the limits, working alongside a tough daily training regime and often felt both physically and mentally wiped out. Competing on the biggest stage, in the fastest and one of the most dangerous Paralympic Sports brings immense pressure. I have discovered that parenting is equally intense and relentless! Sylvie doesn’t care if I haven’t slept for more than two hours in a row for the past four months, she perseveres noisily with her demands until I work out what she wants and appease her! It is exhausting, exasperating and more stressful than risking my neck skiing down the most treacherous ski run. I am unable to stand due to a spinal cord injury. At only 5’2”, heavily pregnant with a 10lb 8oz baby was very uncomfortable. Two weeks overdue and with no sign of labour, dreams of a natural birth were dashed when doctors aired concerns about the size of the baby and recommended a Cesarean Section. 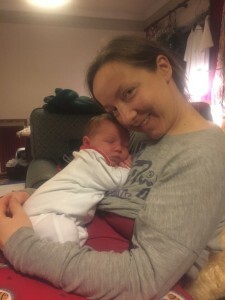 Aside fears for the baby’s health, I dreaded a C Section most that recovery would be especially long and hard as I’m so reliant on the functioning parts of my abdomen. Although a far cry from the hypno water birth that I had hoped for, the birth was surprisingly euphoric. I was fearful before they cut me, but the ecstasy of birth, the pure joy on hearing her first cry, were incredible! My husband, Pete said ‘It’s a girl!’ then our warm, wet baby was on my chest, nuzzling my face. The intensity of love I felt immediately for her is indescribable. We named her Sylvie Louisa; Louisa after my great friend who died just before I raced in the Vancouver Paralympics. It is hard at times. The first week in hospital I could barely move, let alone pick Sylvie up. Pete was able to stay, is loving being a dad and doing brilliantly and has been hugely supportive throughout, as have both of our families and many friends, old and new. Meditation and yoga classes helped me relax and grow in confidence throughout my pregnancy and early motherhood. Regular physiotherapy has also helped but it still took approximately 6 months to recover from the operation. I remember gazing at my tiny, perfect baby and willing her not to grow up too fast, every day is precious. Although there are days when I find myself wondering why Pete’s not home yet, before realizing its 11am and I haven’t even had lunch! Yet every new development fills me with pleasure. Although I worried about leaving my vulnerable baby; about how I’d cope as she got heavier; how I’d get her in the car; keep her safe when she is toddling, I have discovered that as a parent you find a way. Belinda, my yoga instructor says, you don’t have to be perfect, just do your best. Being a Mum may pose different challenges to me than my able-bodied friends but I’m just another mum. We all worry, but we struggle on. I have a newfound respect for parents! Becoming a mother is undoubtedly the most wonderful experience of my life. Pushing about in a wheelchair with a baby certainly gets people talking to you, as do twins. My brother, Ben, and his fiancée Heather, have twin babies and two boys under five, so I can’t complain about looking after one little bundle of joy! That said, whenever I see a wheelchair user parent, I feel a sense of solidarity. I’m incredibly fortunate and am excited about watching Sylvie grow up, there is so much more to come. Sylvie certainly isn’t letting anything stop her – if I adapt to motherhood half as well as she is to life with a parent in a wheelchair, together we shall go far! I met Matt Hampson or Hambo, during my 3 months of rehab in Stoke Mandeville. He broke his neck during an England Under 21 rugby training session but rather than let being paralysed from the neck down, and breathing via the aid of a ventilator stop him, it seems to have spurred him on! 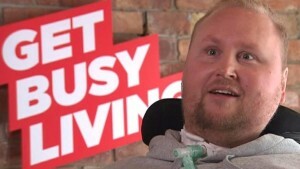 Hambo set up the Matt Hampson Foundation, and with the motto ‘Get busy living!’ they provide advice, support, relief and/or treatment for anyone suffering serious injury or disability which has arisen from any cause, but in particular from participation in or training for any sport, sporting activity or other form of physical education or recreation. In 2006 my life was turned upside down. I was 26 and aspiring to become a professional snowboarder, but whilst competing in a boardercross competition in Japan, I crash landed a 30 foot tabletop jump. The next day, the doctor told me I’d broken my back had a 98% chance that I would never walk again. Not walking wasn’t a major concern but I was devastated by the thought that I’d never snowboard again or achieve my sporting dreams. I lay in hospital watching one of my competitors compete in the Turin Olympic Games; that was one of the hardest experiences of my life. However I spoke to a Canadian Paralympic Alpine Skier and immediately decided to try the sport. A year later I discovered just how challenging monoskiing is but I knew I’d discovered a new passion. I went from feeling as if my life was over to setting new goals to work towards, becoming a Paralympic skier. After three years of intensive training with the British Disabled Ski Team, I was delighted to finish 6th in Slalom in the 2010 Vancouver Paralympics. I set my sights on Sochi 2014 but there was very little financial support so training was my biggest challenge. Skiing is notoriously expensive as it requires highly specialised kit and you have to train predominantly abroad. My cousin suggested approaching the Matt Hampson Foundation. It was great to see Matt again, after all he has achieved, and the charity agreed to fund two British Team training camps to Austria and then I won 6 World Cup medals in the build up to Sochi to add to my 57 career medals. I was elated to qualify for all 5 Alpine events and get selected for the British Paralympic Team for Sochi 2014. Without the support of the Matt Hampson Foundation, I would have been less well prepared and may not have qualified for the Games. I competed hard in Sochi, pointing the ski down in horrendous conditions on the toughest downhill course in the history of the Winter Games. It was going well and I was in bronze medal position when I crashed at 68mph. Miraculously I didn’t hurt myself. I competed in the other events, and finished 4th, 6th and 8th. I was disappointed. I have had bleak days. But feel incredibly fortunate. I have spent 7 years representing GB at the very top level in the fastest and one of the most dangerous Paralympic Sports. I’m extremely passionate about skiing and my supporters have made it possible for me to achieve things I never thought possible. Thank you Hambo, your team and fundraisers for making dreams come true!